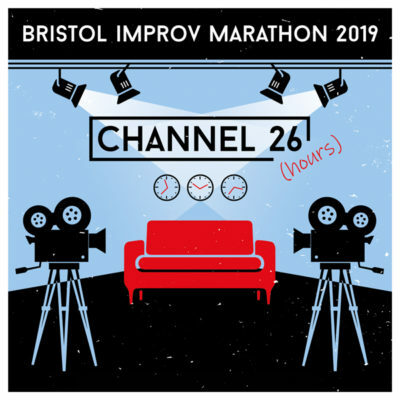 Closer Each Day Company, in association with The Bristol Improv Theatre and The Wardrobe Theatre present the fifth annual Bristol Improv Marathon! This is Studio 26: the cafeteria is populated with breakfast news presenters, camera operators and fake-blood soaked hospital drama extras. Quiz show contestants hover nervously in the lobby while runners fetch endless polystyrene cups of coffee. This season’s hottest reality TV producer is busting balls in the control room. It’s where dreams are made… if your dreams happen to be local news. The marathon will be in 2 hour ‘episodes’ with short breaks in between. The first episode runs from 8pm-10pm, then 10pm – midnight and so on, with a musical episode from 2am – 4am and a kids episode at 10am.